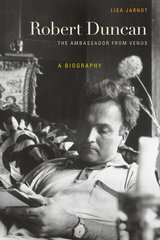 We’re thrilled to announce that Lisa Jarnot’s book Robert Duncan, The Ambassador from Venus (August 2012) has been shortlisted for the National Book Critics Circle prize. This definitive biography gives a brilliant account of the life and art of Robert Duncan (1919–1988), one of America’s great postwar poets. Jarnot takes us from Duncan’s birth in Oakland, California, through his childhood in an eccentrically Theosophist household, to his life in San Francisco as an openly gay man who became an inspirational figure for the many poets and painters who gathered around him. Winners will be announced in New York on February 28, following a reading by the NBCC finalists on February 27. Another bit of exciting poetry news: renowned beat poet and Of Indigo and Saffron author Michael McClure’s poem “Mephisto 20” will run in this week’s New Yorker. Here on the New Yorker’s Page Turner blog, Rebecca Foresman interviews McClure about the themes in the poem.